Ramesses II built seven temples in Nubia. 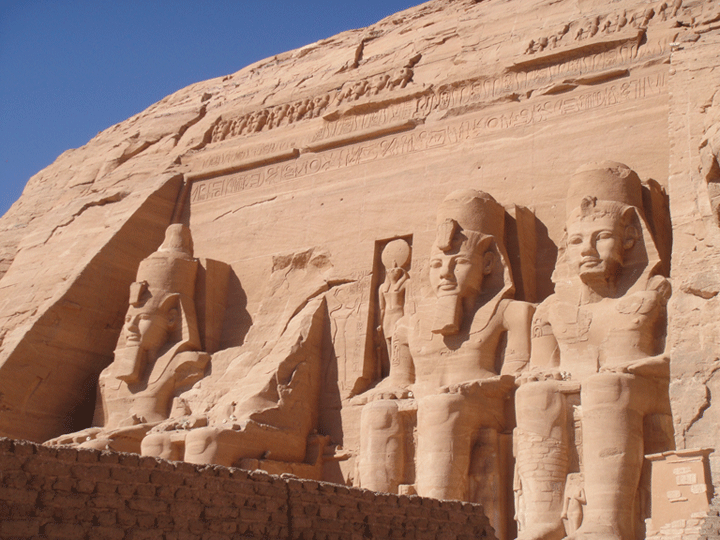 The huge, rock cut temple of Abu Simbel is the most impressive. Construction began around the fifteenth year of his reign and continued for about twenty years. Somewhere during this time, Ramesses ordered his workmen to re-carve the scenes on the walls to portray him as an equal of the gods. 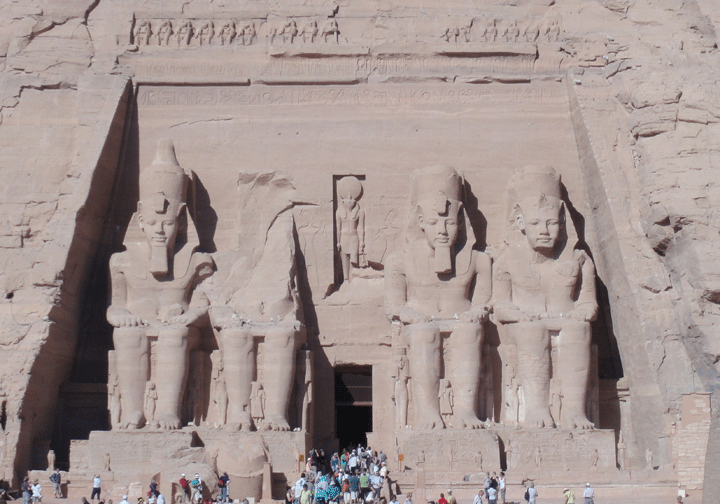 When it was finished Ramesses called it “The House of Ramesses, Beloved ofAmun.” Pictured here are three of the four giant statues of Ramesses II that make up the facade of the temple. They tower 66 feet above the ground. The head and torso of the fourth statue lies on the ground, victim of an earthquake in 27 BC. Standing on the cornice is a row of baboons also known as the greeters of dawn.Standing with hands raised in the Egyptian symbol of praise, they are the first part of the temple to recieve the rays of the sun at dawn. They stand ready to give praise to Ra as he is once again born into the land of the living. In the center stands Re-Harakhte, one of the gods for whom this temple is dedicated. Almost as amazing a feat as the original construction of this remarkable temple, was the dismantlingand moving of the monument some 215 feet to higher ground where it was than reconstructed. It was moved to save it from the rising waters of Lake Nasser. The lake was formed when the Aswan High Dam was built in the early 1960’s. The moving of this temple and the smaller temple of Nefertari took four years. It was carried out with financial and technical assistance from around the world. The final price tag was 40 million US dollars. The next photograph isLooking up to Ramesses II.